The problem with doing it myself, however, is I don’t. Plain and simple. I like meal planning… sometimes. But usually it’s such a chore and waste of time and stress. Then I have to go to the grocery store, pick out all the ingredients, haul them up to my apartment, prep the meal, and the clean up! The worst part was that I would over-cook and under-estimate how much the two of us would eat. I would tell myself that I’d eat the leftovers from the meal, but that’d only last about a day (if that). It was so wasteful. The alternative was not much better. Eating out all the time is extremely pricey–in price and calories– in comparison to cooking at home. It was killing my budget. The other issue I was having was I got burnt out from the same food and meals over and over. It felt like there was no winning. My Aunt Joyce was telling my family about her great experience with the service. She had been using it for a year, and explained that they almost never repeat the same meal twice, it’s always a new a different type of food or ingredients she wouldn’t normally pick, the meals are perfectly portioned with no leftovers, and it’s $10/person. These were all positives in my book since I struggle with picking a diverse variety of meals, always tend to use the same ingredients, end up having lots of full bottles of random spices and sauces in my fridge, and I tend to waste leftovers because of boredom. My aunt sent me a week of free meals, and I absolutely love it! I love getting a package every week dropped on my doorstep. I get excited for “fun” mail (versus bills), and this definitely counts. I love that I get to try new ingredients and types of cuisine that I would never pick on my own. They used regionally locally sourced ingredients for sustainable practices, and all of their ingredients are high quality. I generally don’t pick organic foods, but they strive for the highest quality possible. I love that I don’t have excess, odd ingredients filling up my pantry for that one meal I tried. As a bonus, I think it’s helping Brighton and I manage our portions better. 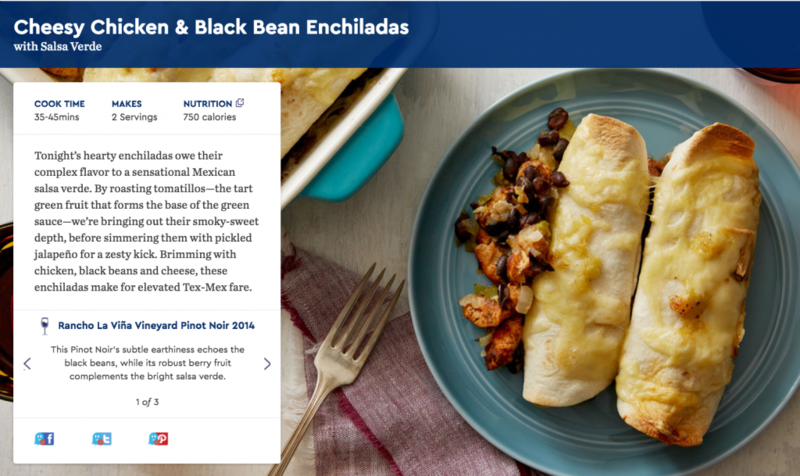 Instead of the huge portions at restaurants they give you, Blue Apron gives us portions that leave us satisfied, not overly full or left wanting more due to hunger. They have cooking tips and techniques on their website/app for you to follow if you feel like you don’t know how to cut or prepare certain ingredients. I also feel like I’m developing better techniques as a home chef. As you may recall, I am not the most graceful person in the kitchen as I sliced my finger and tendon back in October. I like that I get my delivery on Tuesday so I have meals planned for most of the work week – Tuesday, Wednesday, Thursday. I feel more excited about trying new dishes, and I feel better after dinner. Whereas eating out can make you feel just gross with all the added sugars and fats. 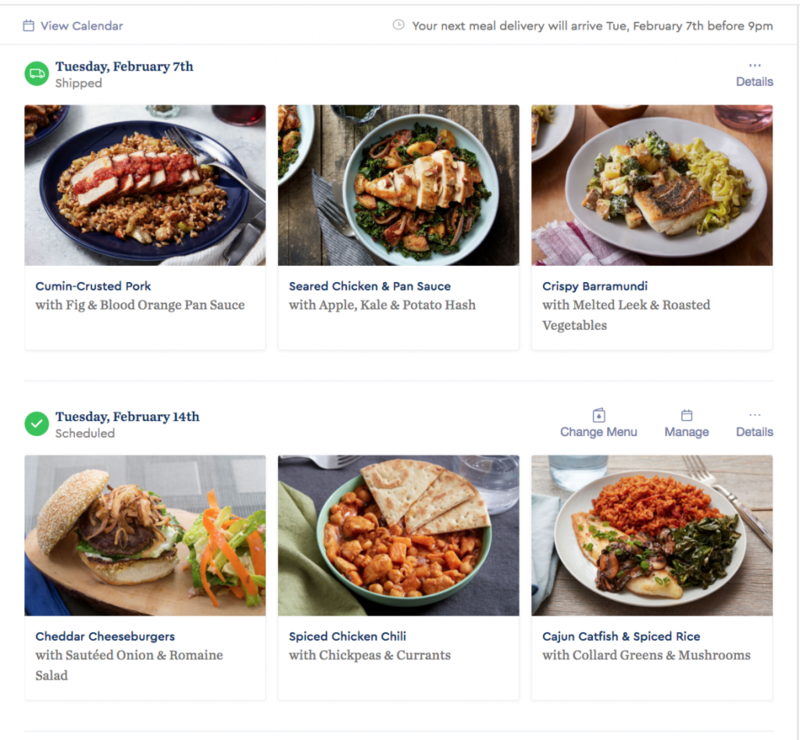 This is a sample of what you see for your “Upcoming Meals” – They show you about a 4-6 weeks worth of meals at a time to get your tastebuds craving! ❓ I don’t get home from work until after 5pm. Can the box sit outside without spoiling? Yes! They come with two huge ice packs that stay frozen for hours. I haven’t tested it, but my aunt said it should be good out there for at least 12 hours. ❓How long do the ingredients last in the fridge? The website says a week, but I always cook the three meals in a row. ❓Can I change the delivery date if I don’t want it on Tuesday? Yes! When you sign up, you pick your usual delivery date but you can change it online at any time. You can also change it for one week if you need to go out of town. ❓Can they cater to gluten free/vegan/vegetarian/food preferences? Absolutely! My cousin doesn’t eat pork, and my friend doesn’t eat beef. There are usually a few different options per week, so you can opt out of certain meat types or meat in general for one week or for all weeks. My sister is a vegetarian and she’s been pleased with the meals so far as well. ❓Can you skip a delivery if you’re going out of town or don’t want meals for a week? ❓Do the ingredients come grouped together within the box per meal? No, but I actually enjoy the sorting process. It gets me excited for what new ingredients we’ll be using, and I like to pick which dish based on my cravings that day! ❓How long do the meals take to make? I plan about an hour per meal from start to plating. Some recipes take less time, but it gives you that time on each of the recipes so you can plan accordingly. I also usually cook them alone, but if you have a sous chef, it might be quicker. If you’re curious, you can sign up to try out! I have free meals to give out if you’re interested. Send me an email, and if I have any left I’d be happy to send you a week of free meals! I love Blue Apron! I have been using it for years! I usually get about 1 set a month. I don’t do it as a long term option because I find it to be pricey and need leftovers for lunch. However, like you I love the diversity of different meals, and not having to shop and think what’s for dinner. 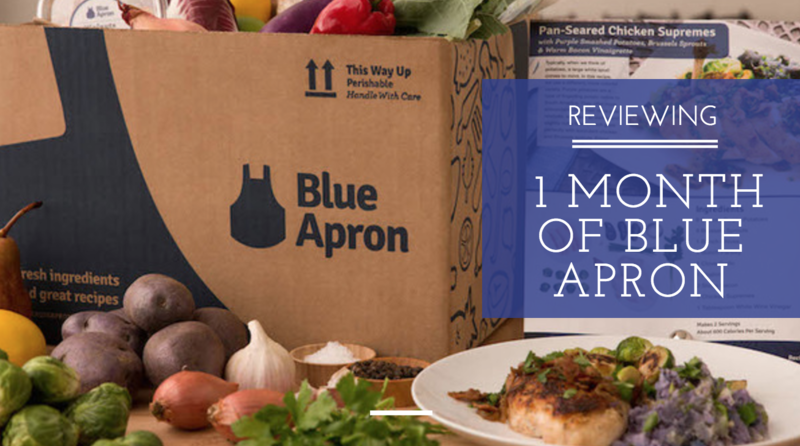 I have had some amazing Blue Apron meals, and only a few that were EH. My only complaints are A: The price, B: No leftovers and C: Some of the meals take a WHILE to cook. Oh really?! I didn’t know that! We have liked most of them, but there have been some not as stellar ones. Overall, at the very least it’s convenient and adds diversity!